Unfortunately the MWS API (the system Amazon allows 3rd parties to communicate with them through) has not been updated to handle combining commingled inventory with seller labeled inventory. That being said, there is a workaround in InventoryLab, if you want to send all of your products within one shipment. You will want to choose the option to “Send Product Feeds” at the end of your shipment and use those product listings to create shipment plans from the items you listed from InventoryLab. 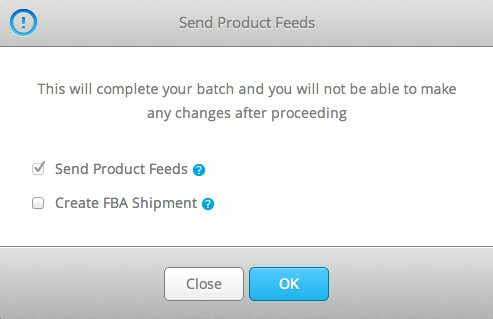 From Inventory>Closed Batches you'll choose to Export and a drop down will give you two options. Click Shipping plan to download the batch information into a .txt file which contains all of the data within the batch needed for the FBA shipping plan. Note: You must wait 15 to 30 minutes for your feeds to fully send your listings over to Amazon prior to uploading your Inbound Shipping Plan into Seller Central. If you attempt the upload too early, Amazon will give an “Unknown SKU. The SKU for this product is unknown or cannot be found.” error.